The collapse of the ABDA Command and the continued movement of American troops into the South and southwest Pacific raised in acute form the great question of strategy that had been deferred by the ARCADIA Conference-the relation between plans for U. S. Army deployment in the Pacific and plans for U. S. Army deployment in the Atlantic. Of some l32,000 Army troops that embarked for overseas destinations front the beginning of 1942 through the middle of March, only about 20,000 sailed for Iceland and -Northern Ireland. During the same period over 90,000 left for stations along the "line" Hawaii-Australia.1 Still other commitments to the Pacific: remained to be fulfilled. 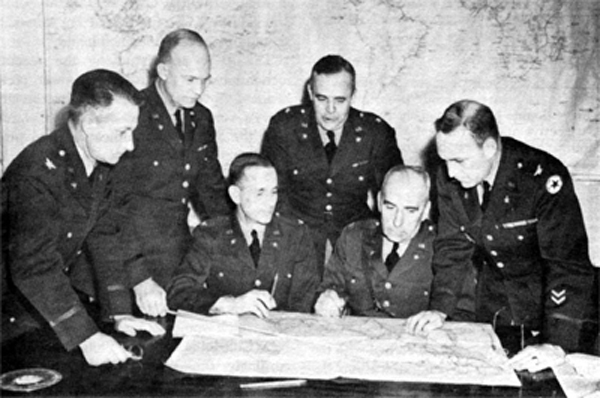 To set a limit to future movements of Army forces into the Pacific and find a basis for increasing the rate at which Army forces would he moved across the Atlantic became, during February and March, the chief concern of General, Marshall and his adviser on the War Department staff, and the focus of their discussion of future plans with the, Army Air Forces and the Navy. There was, moreover, a deficit to be met in service troops for the forces recently sent (and any new forces to be sent ) to the South and Southwest Pacific. The amount of the deficit was as vet undetermined, it being uncertain how far locally available labor would supply the needs for unloading and warehousing cargo, construction of facilities, laving out of roads and airfields, and other services. But in any event the movement of over 40.000 additional ground troops to Hawaii, two new garrisons : perhaps 10,000 men ) to the South Pacific, and two more divisions ! about 30,000 men ) and the remainder of the 41st Division ( about 7,500 men) to the Southwest Pacific-- together with the movement of service units to meet existing deficits and those created by new movements-would certainly involve the continued use throughout the spring of most of the troop shipping available in the Pacific. It would, moreover, involve continued heavy pressure on cargo shipping. The scheduled movement of munitions and other supplies and equipment had not as vet caught up with the troop movements already initiated, and supplementary shipments of supplies and equipment, as of service troops, would have to be scheduled as the limitations on what was locally available became established. bombers operating between Hawaii and Australia in February and March. The Army pursuit squadrons assigned to New Caledonia, the Fijis, and Christmas ; but not those assigned to Canton and Palmyra) were present with their planes. But the one bombardment unit assigned to the South Pacific-a squadron of medium bombers for New Caledonia-was due to be diverted from Australia only late in the spring, when the flight crews should arrive from the United States, and only over the objections of the Army Air Forces. 30 Of all the deficiencies in the planned deployment of Army forces on the main Pacific "line" Hawaii Australia (as also in Alaska), the shortage of bombers, and particularly the lack of bombers in the South Pacific, had become and was to remain the focus of the most persistent criticism from the Navy Department and from both Army and commanders in the Pacific. And it was the point at which the War Department was least willing to revise and expand the planned deployment of Army forces in the Pacific. The Navy wants to take all the islands in the Pacific--have there held by Army troops, to become bawl for Arm. pursuit and bombers. Then! the will have a safe place to sail us vessels. Rut they will not go farther forward than our air (Army) can assure superiority. a. What is the general scheme or concept of operations that the occupation of these additional islands is designed to advance? Are the measures taken purely for protection of a line of communications ~or is a step-by-step general advance contemplated? b. What islands will be involved? c. What Army troops, particularly Air, will your proposal eventually involve.' I feel that a definite statement on this point is necessary. Requirements for troops, especially Air Forces, for operations and for training and expansion are such that I must know definitely the extent of each commitment.
. . . the requirements for U. S. air units in other theaters (Burma--China, Alaska, Hawaii. Panama-Caribbean, Great Britain for German bombing, now the Near East, a possible African expedition, and the U. S. Coastal regions) would seem definitely to limit for some time to come the extent to which we can provide for a further expansion in the Pacific-Australian theatre. The joint agreement to send these two additional garrison forces into the South Pacific did not indicate agreement between the War and Navy Departments on the question of Army deployment in the Pacific. The leader in formulating the Army view was General Eisenhower. As chief War Department operations officer for the Pacific, had recognized and had in fact insisted that the movement of reinforcements to the ABDA area should take precedence over "everything else-Magnet, Gymnast, replacements in Ireland.'' 37 But he also considered this policy as necessarily temporary. The struggle to secure the adoption by all concerned of a common concept of Strategical objectives is wearing roc: down. Everybody is too much engaged with small things of his own.
 . . . in the resent of a war involving both oceans, the U. S. should adopt the strategic defensive in the Pacific and devote its major offensive effort across the Atlantic.
 . . . we must differentiate sharply and definitely between those things whose current accomplishment in the several theaters over the world is necessary to the ultimate defeat of the Axis Powers, as opposed to those which are merely desirable because of their effect in facilitating such defeat. The United States interest in maintaining contact with Australia and in preventing further Japanese expansion to the Southeastward is apparent . . . . but . . . they are not immediately vital to the successful outcome of the war. The problem is one of determining what we can spare for the effort in that region. without seriously impairing performance of our mandatory tasks. In dealing with the first of these three points, the memorandum applied the "strategic axiom" that the commander should first attack and defeat the weaker force of a divided enemy. Eisenhower reasoned that although Germany and its satellites were stronger in total combat power than Japan, Japan was still "relatively stronger" since it was not at war with the Soviet Union and much less accessible to attack by the main forces of the other Allied powers. Moreover, it took three to four times as many ships to transport and maintain a given American force in the Pacific as in the Atlantic. Therefore, Eisenhower concluded, "logistic reasons, as well as strategic axiom, substantiate the soundness of the decision to concentrate against the European Axis. British communications to the Near and Middle East and the physical junction of our two principal enemies. Important, but less critical, advantages will accrue to thorn, also. through conquest of Australia and the islands immediately to the east thereof. a. Maintenance of the United Kingdom, which involves relative security of the North Atlantic sea lanes. b. Retention of Russia in the war as an active enemy of Germany. c. Maintenance of a Volition in the India Middle East Area ,shish will prevent physical junction of the two principal enemies, and will probably keep China in the war. b. Holding of bases west and southwest of Hawaii. c. Security of Burma, particularly because of its influence on future Chinese action. d. Security of South America south of Natal. f. Security of bases on Vest African coast and trans-,African air route. g. Other areas and haws useful in limiting hostile operations and facilitating our own. b. To maintain the most advanced bases possible for eventual offensives against the Japanese Empire. c. To create diversions in favor of the vitally important India-Burma area. d. To deny the enemy free access to the Southeastern Pacific and its natural resources . . . .
e. To support the battle in the N.E.I. as long as possible, . . .
and one light squadron be retained temporarily in Australia and, as additional material became available, be withdraw to Hawaii to provide a mobile reserve for employment to the southwest. We should at ones' develop, in conjunction with the British. a definite plan for operations against Northwest Europe. It should be drawn up at once, in detail, and it should be sufficiently extensive in scale as to engage from the' middle of May onward, an increasing portion of the German Air Force, and by late summer an increasing amount of his ground forces. The choice of northwestern Europe as the invasion point followed from the fact that another of the three essential objectives--protecting the United Kingdom and the -North Atlantic sea lanes--could be achieved concurrently with building up resources in the British Isles for a cross-Channel assault. Greater shipping economy thus could be effected than if another " 'first priority' convoying" problem were created by establishing a "large force at any location other than the Northeast Atlantic.'' Indeed, asserted Eisenhower, "The United Kingdom is not only our principal partner in this war; it offers the only point from which effective land and air ,operations against Germany May be attempted." The availability of shipping controls all decisions concerning overseas movements during 1942. The total capacity available to the United Nations in 1942, even if the building program is accomplished, will not exceed the capacity available in 1941. The shipping situation is so critical as to necessitate effective pooling of shipping and restriction of non-military use to an absolute minimum. The remainder must then be used on the shortest runs practicable in the manner which will contribute most to the early defeat of Germany. The effective defense of the Western Pacific, including the defense of all the important islands desired as bases there, would require a large proportion of our available forces, and would jeopardize the success of the offensive against Germany. Consequently. it must be accepted that we are unable to establish a system of bases and forces, so disposed as to give depth to the defense of the line between Hawaii and Australia. The minority felt that Australia should be held by minimum forces and that the defense of Australia and New Zealand should be a British responsibility. It indicated that, with the' fall of Singapore, the importance of the Anzac area had been somewhat reduced (rather than greatly increased), since it was too distant from Japan for the waging of a decisive offensive against Japan. The minority paper insisted that the United States and Great Britain must accept the fact that they might be forced to relinquish the lines of communication from the United States to Australia if its defense should jeopardize the success of the offensive against Germany. The lines of communication, it contended, should be secured with the forces already provided. A) Ensure the security of the military position in the Pacific Theater by strong reinforcements . . . at the expense of executing a vigorous offensive against Germany with United States Forces. Contain Japanese forms in the southern portion of the Pacific Theater: inflict attrition; and exert economic pressure by the destruction of vessels . . . .
B ) While Russia is still an effective ally, concentrate the mass of our forces for a vigorous offensive, initially from bases in England, with the objective of defeating Germany. Until Germany has been defeated, accept the possibility that the Southwest Pacific: May be lost. The 41st Division is leaving the U. S. by the eighteenth of this month reaching Australia about April 10. The next convoy of half a division could leave about April l5 and the remainder about May 15. If the total number of New Zealand and Australian troops retained for fighting in the Middle Fast, India or Ceylon are in excess of these two divisions, a third U. S. division can leave for the Southwest Pacific about May 15. The United States also agreed to furnish shipping to move two British divisions (40.000 men) with their equipment from the United Kingdom to the Middle East and India in April and May. This movement would require the withdrawal of eleven lend-lease ships from railings for Burma and the Red Sea, and was contingent on a number of important matters, namely, that during that period a North African operation not be undertaken, the movement to Northern Ireland be limited to those troops which the two convoys planned for the Middle East could bring over from the United States, and movements to Iceland be stopped. This movement would also have the effect, the U. S. joint planners estimated, of seriously curtailing American contribution to an air offensive and virtually eliminating American contribution to a land offensive against Germany in 1942. 56 The joint planners found that under the new commitments the available of troop transports would become the limiting factor during the second and third quarters of 1942, after which the availability of cargo shipping would again control. 57 Although the tentative commitments might possibly haw some effect on transportation of troops to the United Kingdom, all Pacific troop movements were expected to be carried out as indicated in the previous schedules.58 The planners suggested that should the British not be willing to launch an offensive in the European theater in 1942, the agreed strategic concept should be reevaluated and the possibility of concentrating American offensive effort in the Pacific considered. The debate over Army commitments in the Pacific was accompanied, and its outcome was very largely determined, by a clarification of American responsibilities for military operations in the Southwest Pacific, following on the collapse of the ABDA Command. Within the week after the fall of Singapore the GCS accepted as virtually certain the loss of Sumatra and Java.61 On 23 February they ordered General Wavell to dissolve his headquarters at Batavia, permitting command to pass to the Dutch, whose forces were still engaged, with some Allied aid, in fighting a delaying action in Java.62 Although this transfer of authority technically placed the United States forces in the Philippines under Netherlands command, MacArthur was to "continue to communicate directly with the War Department." 63 The two senior U. S. Army officers in the Batavia headquarters were ordered, upon release by Wavell, to proceed to the two flanks of the disintegrating ABDA area--General Brereton to India, to become Commanding General, Tenth U. S. Air Force, with headquarters at Karachi, and General Brett to resume command of all U. S. forces in Australia.64 These interim readjustments marked the end of the first short-lived experiment in international unified command for World War II. It seems to me that the United States is able because of our geographical position to reinforce the right flank Australia and New Zealand much better than you can and I think that the L . S. should take the primary responsibility for that immediate reinforcement and maintenance. using Australia as the main base . . . . .Britain is better prepared to reinforce Burma and India and I visualize that you would take responsibility for that theater. General Eisenhower meanwhile prepared a study along the lines of the President's proposal., Eisenhower defined the three areas of strategic responsibility as follows:( 1) The Pacific area, which included the American continents, China. Australia, New Zealand. and Japan, but excluded Sumatra and the Malay Peninsula, was to be an area of American responsibility. (2 ) The Indian Ocean and Middle East area- the Indian Ocean and all land areas contiguous thereto west of Singapore, and the Middle and near East was designated an area of British responsibility, with American assistance limited to material aid from surplus production. It was stipulated that the United States should have access to bases in India and routes to China within this area. (3) Europe and the Atlantic, in which the major effort against Germany was to be made, was to be an area of British-American joint responsibility. Chief; Col. A. S. Nevins; Brig. Gen. R. IV. Crawford; Col. C. A. Russell; and Col. H. A. Barber, Jr. The Prime Minister replied on 18 March, generally concurring in the President's proposals and stating that he and the British Chiefs of Staff saw "great merits in simplification resulting from American control over Pacific sphere and British control over Indian sphere and indeed there is no other way." The Prime Minister implicitly accepted the postponement of a combined North African operation and movements of American troops to the United Kingdom as necessary corollary to the use of shipping few deployment to the Southwest Pacific and movement of British troop, to the Middle East. With the undemanding that British and American efforts everywhere could be directed by "machinery of the Combined Chiefs of Staff Committee acting directly under you and nit'," the Prince Minister also approved the President's proposals for "executive conduct" of the war. methods of achieving this would be capable of being discussed by combined Chiefs of Staff Committee in Washington . . . .
signed to MacArthur were to "hold the key military regions of Australia as bases for future offensive action against Japan, and in order to check the Japanese conquest of the Southwest Pacific Area" and to "check the enemy advance toward Australia and its essential lines of communication . . .94 Although his directive included the provision that he should "prepare to take the offensive," the mission assigned him was primarily defensive, in accordance with the strategy in the Pacific. that the U. S. Joint Chiefs of Staff had developed in March. He was to maintain the American position in the Philippines and protect communications and route shipping within the Southwest Pacific Area. He was directed to exert economic pressure on the enemy by destroying his transport vessels and to support the operations of friendly forces in the Pacific Ocean and Indian theaters. There were certain broad limitations on MacArthur's authority. As supreme commander, he was authorized "to direct and coordinate the creation and development of administrative facilities and the broad allocation of war materials," but was declared ineligible to command directly any national force and was not responsible for the internal administration of the respective forces under his command. The JCS reserved to themselves the exercise of jurisdiction over all matters pertaining to operational strategy, with the Army Chief of Staff acting as agent for the JCS. General jurisdiction over grand strategic policy and related factors including the allocation of forces and war materials was given to the CCS.